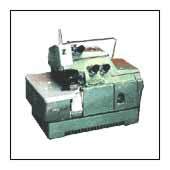 REVO "DCZ-200" series machine is the latest and the most economical high speed overlock stitcher used for light to heavy weight knit goods or woven fabrics of cotton, nylon, elastic & synthetics. This machine is ideal for high speed work on t-shirts, shirts, sportswear etc. Completely automatic oil lubrication with force feed Lubrication pump. 6000 Stitches per minute (High Speed). Suitable to sew light to heavy weight materials. Well-balanced construction, needle and ball bearings for main shafts, and newly designed lubrication with high pressured oil, enable the machine to run at the ultra-high-speed of 6000 stitches per minute entirely free from vibration and noise. Stitch Type Over-edge Seaming, Blind Hemming, Safety stitching. No. of Needles / Threads Available in 1 - 2 needles with 2,3,4 & 5 Threads variation. Fabric Cutting Done with a set of Special steel knives made of a super hardened alloy. Lubrication Force Feeding by gear pump & pressure regulating valve. Needles DC x 1 Size 9 to 18. Dimensions (w x h x d) 350 x 225 x 285 mm. Price Rs.15,500/- to Rs. 18,500/- (US$ 337/- to US$ 402/-).